Redirect System Default Temp Folder. How To Redirect System Default Temp Folder. back home » Knowledge Base » How To Redirect System Default Temp Folder. no matter where you'll decide to install it. The installation files will be extracted first onto C:\Users\UserName\AppData\Local\Temp if extraction is required before the actual installation process will start. 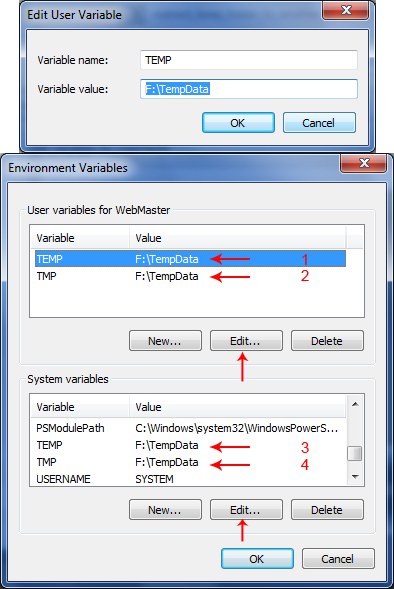 Simply because this is the default User variables temp folder. Secondly, the system files and folders needed to bridge between the software and the application will also be extracted into the C:\windows\temp which is the default System variable temp folder. However, some programs will delete these files after installation, others will just dump them there, and this could somehow obstruct the performance of your system in some way. In this tutorial, you'll learn how to redirect windows System default Temp folder from C:\windows to another partition's folder. So application programs' pre-installation files, and user accounts information won't be dumped on the system partition leaving it in peace. Where Can I Redirect My Temp Folder To. The main work here is to find where to allow the dumping of unnecessary extracted files, so you can delete them later, leaving the system partition only for the operating system and application programs. This means apart from other partitions like Pagefile [SWAP] you can redirect to any other partition of your choice, provided a Temp folder is created and the former, redirected to the new. On my system, I've created a partition with the name TEMP, [This is the largest Partition here] and a folder called TempData, in which I've redirected my system Temp folder into. As you can imagine, this is where I store all my works, and no application program is installed here. This makes it a perfect place to redirect all dumps to, as long as they are in separate folders making it easier to differentiate my dump folder from the others. Choose A Partition, Create A Folder, And Start Redirecting. You'll first create a folder with the name TEMP inside the Partition you want to redirect your files and folders. You can name the folder as desired. For example; TempData instead of TEMP. In this tutorial I will use a partition on my system [F:/] containing a folder name TempData, throughout the whole process, this will make it easier for your understanding. [F:\TempData]. 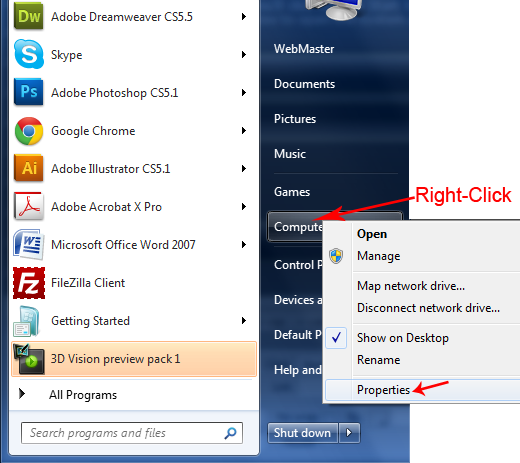 Now, click on the Start button of your operating system, right-click on Computer, and select Properties in the context menu to open the system panel. See illustration below. 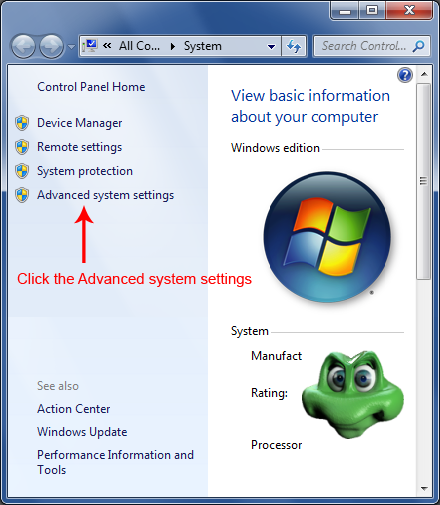 On the system panel, click the Advanced system setting below the "Control Panel Home" to open the system properties dialog box. See illustration below. 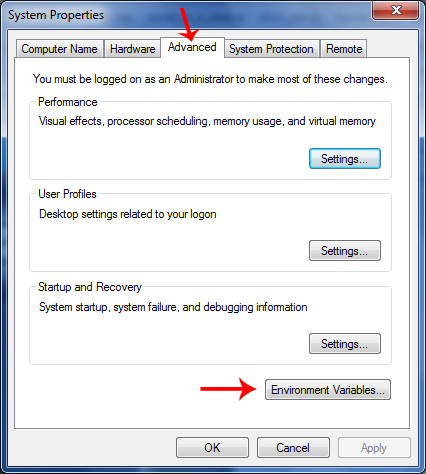 On the system properties dialog box, make sure the "Advance" tab is selected and click on the last button that reads Environment variables to open its dialog box. On the Environment variable dialog box, follow up the illustration below to finish. Select line 1, click the edit button to open the Edit User Variable dialog box, [The small box below], leave the Variable name as is [TEMP]. And enter the path of the partition and folder you want to redirect your temp files to, into the Variable value field. In our case we chose F:\ as the partition and created a folder inside with the name TempData so, we'll have to enter F:\TempData into the Variable value and then hit OK to accept it. Repeat the same method for the rest lines, 2,3, and 4, and make sure to use the appropriate edit button for each group.Be extra careful, 1 and 2 is for the User Variables, and 3 and 4 for the System variables. These are two different groups and must be treated accordingly. If you are finished, click the OK button on the Environment Variables dialog box to accept all the changes done. Close every window and restart your system for the new value to take its effect. 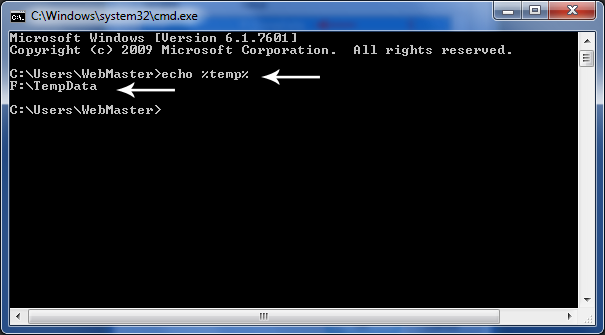 To be sure your temp folder is redirected to F:\TempData, type echo %temp% at the command prompt and cmd will display where your temp file is locating. See Illustration below. Now, you should also find some system temp files and folders in the F:\TempData showing that your system has already started using the redirected folder. Learn how to change the location of browserTemp folder soon coming.